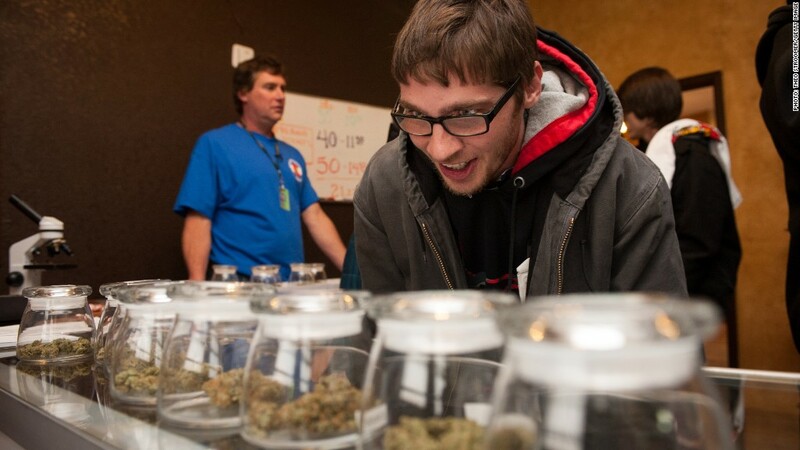 A marijuana connoisseur reviews the offerings at one of Colorado's dispensaries. Industry insiders say the slowdown is not likely to last. Michael Elliott, executive director of the Marijuana Industry Group, attributed the drop in September to the lull in tourism that typically occurs between the summer and winter months in Colorado. Tourists are some of the biggest consumers of Colorado's cannabis. A study by Colorado's revenue department found that out-of-state visitors account for 44% of total marijuana sales in big cities and as much as 90% in mountain resorts. Elliott said that interest in marijuana is only rising. Aurora, Colorado's third largest city, opened its first recreational dispensary in October and that more will open there this month. "There's no reason to expect a loss of interest," he said. "In fact, I'm hearing the opposite." Elliott estimates that recreational marijuana sales could total between $300 million and $400 million this year. Including sales of medical marijuana, the overall industry could be worth $700 million, he added.